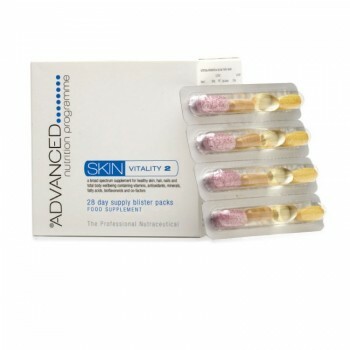 Skin Vitality 2 consists of convenient daily blister strips each containing 4 supplements; a multivitamin and mineral, antioxidant complex, vitamin C with black elderberry and bilberry extracts and omega 3 and 6 fatty acids. The combination includes vitamins A & C, riboflavin and zinc for normal skin; selenium and biotin for hair, along with selenium and zinc for nails. 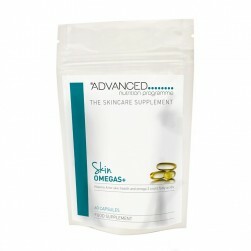 The advanced formulation also contains vitamin D, iron and vitamin C for the normal function of the immune system and antioxidant nutrients such as vitamin E , plus manganese to help protect cells from oxidative stress. Take the contents of one blister strip daily with a meal. Each blister strip contains: multivitamin/mineral, advanced antioxidant complex, vitamin C with black elderberry and bilberry extracts, and omega 3 and 6 fatty acids. NO ADDED: salt, wheat, gluten, yeast, lactose, dairy products, artificial preservatives, colours or flavourings. Skin Vitality 2 consists of convenient daily blister strips each containing 4 supplements; a multivitamin and mineral, antioxidant complex, vitamin C with black elderberry and bilberry extracts and omega 3 and 6 fatty acids. This broad spectrum supplement supports wellbeing. The combination includes vitamins A & C, riboflavin and zinc for normal skin; selenium and biotin for hair, along with selenium and zinc for nails. 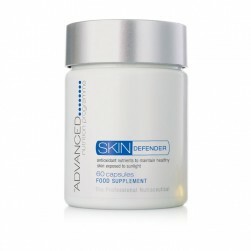 The advanced formulation also contains vitamin D, iron and vitamin C for the normal function of the immune system and antioxidant nutrients such as vitamin E , plus manganese to help protect cells from oxidative stress.